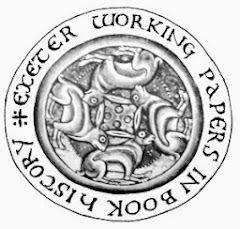 Together they make a case for better recognition of the subject as a serious area of study, in particular to the urgent necessity of research funding, either through the AHRB or the National Lottery, to provide access to the scarce, fragile and endangered source materials on which all future study depends. A programme of digitisation is essential, adhering to recognised technical standards and of a sufficient quality to reveal all typographical minutiae. Research through historical sources is also required. There is also a need for an academic chair to promote the discipline on a continuing basis. It is certainly a subject to be taken seriously. This first attempt at a directory concentrates very much on firms with a base in London. The main sources are Kelly's London directories 1885-1944, 1950, 1958, 1962, 1972, 1976, 1981, and Kelly's directory of merchants, manufacturers and shippers 1986. Abbott's Wood Ltd., 324, Gray's Inn Road WCI, tel: TERminus 8121 (10 lines) 1950. Merchants. Atkins, G.W. & Co., home trade 2, Mount Street W1 1919-25. Shipping agents J.F.Storey & Co., 164, Aldersgate Street EC1 1919-25. Royal warrants to all crowned heads from 1817. "Berkeley" toilet papers rolls & packets. Bedford Toilet Roll and Paper Cutting Co., Thurlow Street and Hasselt Street Works, Bedford, Telegraphic Address: Toilet, Bedford. Tel: Bedford 282. Toilet papers in rolls and packets, also medicated papers, paper coils and wrappings, slitting done for the trade, government and railway contractors 1917-20. Blue Distributors Ltd., 37, Furnival Street EC4, 1940. Bowater-Scott Corporation Ltd (K. Dept. 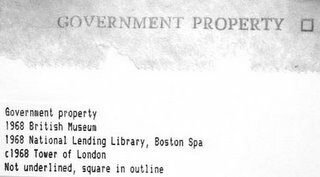 ), Bowater House, Stratton Street W1 tel MAYfair 8080 telegrams Nuseprint 1958; Bowater House, Knightsbridge SW1 1962; Bowater-Scott House, East Grinstead, West Sussex RH19 1UR Tel: 0342-27191 telex 95217 BOSLDN G 1986. Andrex, Samaritan, Marvo and Bravo brands 1958. British Crepe Paper Manufacturers Ltd, 23a & 24, Exmouth Street, Euston Square NW1 1917-24; 42-48, Coburg Street NW1 1921-24. British Patent Perforated Paper Co., 42, Banner Street, St. Luke's EC 1891-93; 42 & 43, Banner Street 1894-95; 92, Banner Street 1896-97; White's Yard, Whitecross Street EC 1898; Garrett Street, Whitecross Street EC 1899; 32A-37, Cowper Street, City Road EC 1900-09; Atlas Works, Berkshire Road, Hackney Wick E9 1910-58+ Tel: East 1876 (2 lines) 1912-30; Amherst 1128 (2 lines) 1931-36; Amherst 4777 1937-58+. Telegraphic address: Medipathic Hack 1936-58+. Sole manufacturers of Bronco (formerly called No. 1 Thin) 1894-1958+ [from 1935 described as the de luxe toilet paper in displayed layout], Sanico 1894-1944+, Queen 1894-1936, British No. 3 1894-1958+, Eureka 1894-1936, Bel-Cap 1894-1936, Mazella 1895-1936, Unico 1896-1944+, Medipathic 1896-1936, Cameo 1897-1958, Gloria Victis 1901-36, San Toi 1902-36, Fidelos 1904-36; Shen-Kin 1904-36, Okayed 1904-36, Vade-Mecum 1904-36, Bronco Capensis 1937-44+, Carmol (medicated) 1937-44+ Capensis 1950-58, Merico 1958, Lavato 1958, Onliwon 1931-58+. British Tissues, 214, Oxford Street W1N 0BQ 1972. Bronco Ltd., Atlas Works, Berkshire Road E9 1962. Centropex International Trading Co. Ltd. (merchants), Sicilian House, Sicilian Avenue WC1 1941-43. Chicago Perforated Wrapping paper Co., 44, La Salle Street, Chicago 1882. Advertised Hotel and Family fixtures and perforated toilet paper, introduced less than two years previously. Advertisement Rickards Collection. Colindale Paper Co Ltd. 116, Colindale Ave NW9 1950-58. Telegraphic address: Papcolco, Hyde, London 1950-58. Tel: Colindale 7551 & 7140 1950-58. Manufacturers of Luxury, Colinco, Papcol rolls 1950. Also manufactured packs. Colley, W.W. & Co., 57B. Hatton Garden EC 1889-91. Continued trading as: Colley's Patents Ltd, 147-150 Great Saffron Hill EC 1892-1902; 18 & 20, Farringdon Road 1903-06; 3-12, Marine Street, Bermondsey 1907-23. Sole patentees of the Terebene perforated tiolet paper 1890-1905; also No. 1 thin, No. 2 standard and No. 3 medium qualities 1890-94. Prize medal, highest award Paris Exhibition, 1889; all the lavatories at the Paris Exhibition were supplied with our patent Terebene perforated paper. Also other qualities 1894. Ship Brand No. 1 thin, No. 2 standard, No. 3 medium and other qualities 1895-1905. Sole patentees and manufacturers of Terebene Medicated, Yelloc Medicated and Ship Brand perforated papers in qualities No. 1 thin, No. 2 standard, No. 3 medium &c. &c. Also of endless cartons from which as one sheet is withdrawn another falls into position 1906-15. Guaranteed British manufacture, pure soft strong soluble, contractors to H.M. and foreign governments 1921-23. Colley's Patents Ltd. See: Colley, W.W. & Co.
Crepe Paper Manufacturing Co. Ltd. 20, Pancras Road NW1 1929; 491-493, Liverpool Road N7, Telegraphic address Crepapco Nordo, Telephone: North 5981 1930-31; Colindale Avenue, Colindale NW9, Telegraphic address: Crepapco Hyde, telephone: Colindale 6432 & 6433 (private branch ex.) 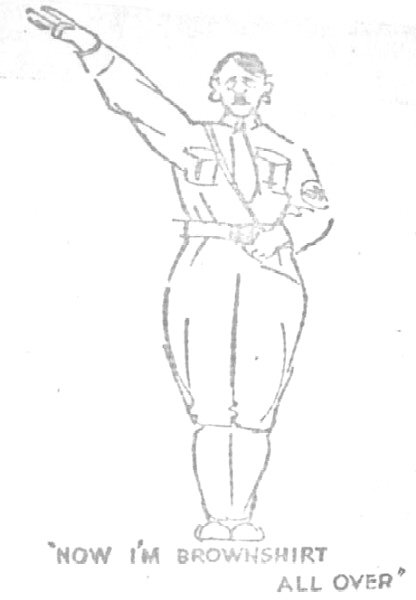 1932-33. Cresta Products Ltd. Devonshire Works, Barley Mow Passage, Chiswick 1950; Devonshire Works, Dukes Avenue W4 1958-62. Tel: CHIswick 4707 1950; Chiswick 6991/5 1958; 6991/7 1962. Telegraphic address: Crestapro, Chisk 1958-62. Manufacturers of Pinecrest toilet tissue 1950. Diamond Mills Paper Company, 44 Murray Street, New York c1890. Manufacturers of Bromo paper, with watermark "Bromo" on each sheet. Highest prize awarded by the Paris Exposition 1878. Pack in Rickards Collection. Dickinson, John, & Co. Ltd. Basildon Works, South Tottenham N15 1950. London office 35/38 New Bridge Street EC4 1950. London stock warehouse: Croxley House, Wharfdale Road, Kings Cross N1 1950. 1962. Downing, John S., 8, Bride Street EC 1894-95. Manufacturer of patented toilet fixtures and refills. Drayton Paper Works Ltd., London SE c1900; South Park, Fulham SW6 1919-34. Main details under paper makers & warehouses. 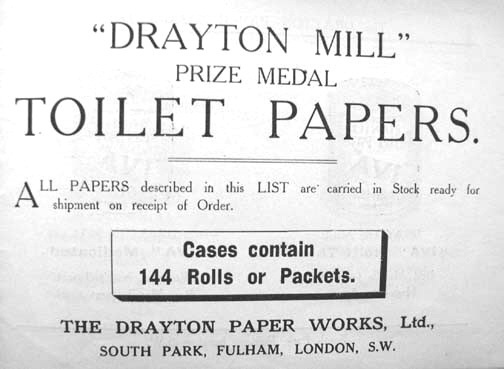 New and revised list of "Drayton Mill" toilet papers issued by G.W.Dray & Son Ltd., Drayton Paper Works, London SE lists: Iva (No. 1 thin), Medicated S.S.P., Waldorf, No. 852, Silko no. 3, Tokio (Japanese), Antiseptic, Guildford, Giant, Light Sanitory, Extra Strong, D.M. Medicated, Club, 444, Standard, Japanese c1900. 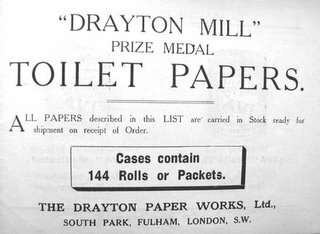 A later New and revised list of prize medal Drayton Mill toilet papers, issued from South Park c1910 lists: Iva (no. 1 thin), Iva (medicated), Best Terebene, 6d Terebene, S.S.P. Medicated with Jeyes' fluid, Waldorf, Sno, No. 852, Special no. 3, Crepe, 676, Tokio, Silko no. 3, Club, Guildford, Antiseptic, Dreadnought, Lion, Hotel, Giant, Light Sanitary, Extra Strong, 444, Standard, Tokio Quality. Catalogues in Maxted collection. Ellis, Phillips & Co., emergency address: Lindsay Avenue, High Wycombe, Bucks 1944. Rye Mill, London Road, High Wycombe, Bucks 1950-58; 11-13, Charterhouse Buildings EC1 1958-62; Lincoln Road, Cressex, High Wycombe 1962. Telephone: High Wycombe 516 1944. Merchants. Emmert, V., 115, Fore Street EC 1905-06. Agent. Fay International Ltd., Friendly House, Chiswell Street, London EC1Y 4UD tel: 01-606 9966 telegraphic address Faytiss London EC1 telex 888111 1972. Federal Paper Co. Ltd., 31-33, High Holborn WC1 1922-25. Fort Sterling Ltd, Mansell Way, Horwich, Bolton BL6 6JL 1986. Tel: 0204-68611 1986. 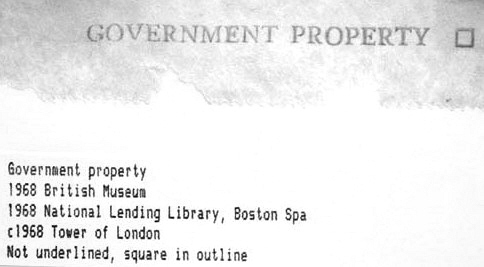 Telex: 63323 FORTS G 1986. Freeder Brothers Paper Mills, Brimsdown, Enfield, Middlesex 1950. Tel: HOWard 1847 (5 lines) 1950. Manufacturers of Satino rolls and packs 1950. Gee Tee Company, Gertex Works, Cumberland Road, Queensbury, Stanmore, Middlesex, Telegraphic address: Gee Tee Stanmore Middx, telephone: Wordsworth 2253/4/5 1938-50. Also paper handkerchiefs, serviettes, soluble sanitary towels. Display advert. Goggin, Maurice, Ltd, 36, Peckover Street, Bradford, W. Yorks BD1 5DJ 1986. Suppliers. Hachette ainé, 14, Rue d'Aboukir, Paris 1910-11. Established 1860. A large French manufacturer of toilet papers of extra quality in rolls, blocks & packets for automatic distributors; seat covers called "L'anticontact", manufacturer of distributing boxes and roll holders. Hoogland, B.T. 88, John Street, New York c1890. Sole agents for Europe 46 Holborn Viaduct London EC c1900. 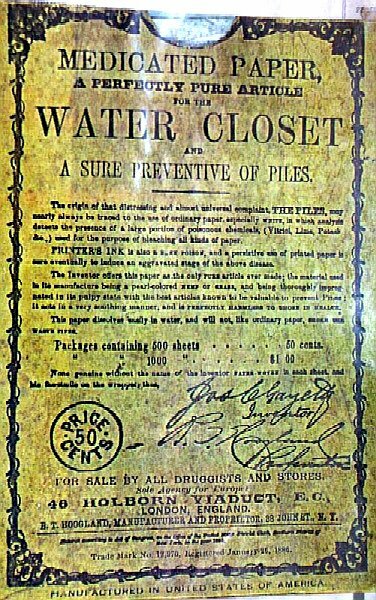 Manufacturers of Gayetty's medicated toilet paper "a sure preventive of piles, each sheet watermarked with the signature of the inventor J.C.Gayetty. The paper was invented and introduced to the public by Joseph C.Gayetty in 1857. Pack in Rickards collection. Innes, Thomas A., 3, Roslyn Avenue, Camberwell SE5 1939-40. Merchant. Jeyes Sanitary Compounds Co. Ltd., 99, Regent Street W1 & Richmond Street, Plaistow E3, telegraphic address Jeyes, telephone Regent 5033 1937-40; emergency address Milbrook Manor Road, Chigwell, Essex, telegraphic address Jeyes Chigwell 1940-50. Telephone Chigwell 2763 (2 lines) 1940. Telephone Hainault 2763/4 1943-44, Hainault 8031 1950. Antiseptic toilet paper in packets of single interleaved sheets. 1958, 1962. Kittybrewster (Paper) Ltd., Head office: Kittybrewster Works, Aberdeen 1962-81; 88/90, Chancery Lane, London WC2 1962-76; Carlisle House, 8, Southampton Row London WC1B 4AE tel: 01-405 7117 1981. Lipton's Paper Mills Ltd, Unity Works, Heddon Street W1, telegrams: Sprays, Piccy, London, tel: REGent 4271 (8 lines) 1950; Devonshire Works, Chiswick W4 1950; West Hampstead Mews NW6 1950; 216, Rotherhithe New Road SE16 1958. Tel: MAIda Vale 2436 1950. London Paper Reelers and Cutters Ltd., 71, Fleet Street 1914-15; 2, Bermondsey Street SE 1915. Luttgen, Matthias, 34, Paternoster Row EC, telephone Central 1473 1908-15. Works: Ottensen bei Hamburg 1908-15. Lynwood's Ltd, Wardrobe Chambers, Carter Lane EC4 (near St. Paul's), telephone Central 8331; 1921-24; Wardrobe Chambers 146A, Queen Vicoria Street 1925-26. Wholesale retail and export. Samples and quotations post free. Mallandian, Albert E., 36 & 37, King Street, Cheapside EC2 1928. Metropolitan Paper Works Inc, St Georges (London), 181 Queen Victoria Street EC4, 48, Eagle Wharf Road N1 & 810/812 Old Ford Road E3 1950. Myers, Henry Horace, 7, Laurence Pountney Hill EC4, telegraphic address: Ambiguity Cannon London, Telephone: City 6272 1924-25. National Toilet Co., 19, St. Dunstan's Hill EC 1896. Neptune Waterproof Paper Co. Ltd., Bridge Works, Cowley, Uxbridge, Middlesex, telegraphic address: Neptune Cowley Middlesex 1927-36. Telephone: Uxbridge 195 1927-35; Uxbridge 1260 1936. Toilet and waterproof paper manufacturers 1927-34. Neptune hygienic toilet rolls 1935-36. Northern Tissue Co. Ltd., Africa House, Kingsway WC2 1935. Pakwel Ltd., 47, Farringdon Road EC1, telegraphic address Pakwelkap Smith, telephone Holborn 4784 1924-27. The Pakwelim series. Paper Cutting and Toilet Requisite Co. Ltd., formerly Patent Toilet Requisite Co. Ltd q.v. Passmill (Paper Products) Ltd, Lime Street, Newcastle upon Tyne 1 1958. Rostron, John & Sons Ltd., 14, Bayer Street, Golden Lane EC1 1939; 47, Houldsworth Street, Manchester 1 1943-50. Rutherford, J. & Co. Ltd., Victoria Mills, Victoria Road, Holloway N7 1921-44, telephone North 3419 1921-50, North 3544 1925-30, telegraphic address Peroofets Holway 1938-50. Victoria paper Mills, Chillingworth Road Holloway N7 1950; Victoria Mills, 29a, Dumont Road N16 1958; Victoria Mills, Chester Road, Shotton, Flint 1962. Regd. trade marks for toilet rolls: Daffodil 1921-37, Crepapco 1925-37, Economic 1930-37, Bulldog 1930-37, Bestofall 1930-37, Samson 1930-37, Victoria 1930-37, Gladio 1930-37, Exmouth 1930-37, Poppy 1930-37, Old Dutch 1930-37, Locarno 1934-37, Desma 1934-37. Manufacturers of crepe papers, serviettes etc 1925-29. Medicated toilet rolls our speciality 1930-37. St. Andrew Mills Ltd., 34, St. Andrew Road, Walthamstow E17, telephone: LARkswood 1014/5/6 1942-50. Telegrams: Samarita, Waltstreet, London. Manufacturers of Samaritan, Marvo, Andrex, Stanex and Androl rolls 1950. Salas & Co., 1-6, Railway Place, 65A, Fenchurch Street EC3 1939-40. Salus Co. Ltd. Lion Works, 3/5, Ferry Lane, London N17 1950-72. Salvas, 1-6, Railway Place, 65A, Fenchurch Street EC3 1931-38. Sanitary Advertising Co., 65 & 67, Neal Street WC2 1934-44, 37 & 38 Strand WC2 1950. Scott Paper Co., Audrey House, Ely Place EC 1909. Sculthorpe, R. & Co. Ltd. Roll holder manufacturers. Blackfriars House, New Bridge Street EC4 1958-62. Tel: FLE 1812/3 1958; FLEet Street 5754/8 1962. Manufacturers of Toilok holder. Secrol Ltd, 74, Cheapside EC2 1958-62. Stern, Henry Charles, 6, Lovell's Court, Paternoster Row EC4 1923-24; 12, Farringdon Avenue 1925-40. Geisha crepe toilet rolls. Storey, J.F. & Co. Shipping agents 1919-25. See G.W.Atkins & Co.
Superior Papers Ltd., Bridge Works, Cowley, Uxbridge, Middlesex, telegrams and telephone Uxbridge 1260/1 1937-50. Manufacturers of Seashore, Mermaid, Deepsea and Star toilet rolls 1950. Swan Mill Paper Co. Ltd., Old Dockyard SE18 1934-42; 92, Regent Street, telephone REGent 0422/3 1943-50; 314/322 Regent Street W1 1958-62. . Softex toilet tissue 1943-50. Saniswan toilet rolls 1943-44. Toilet Papers Ltd., Wardrobe Chambers, Queen Victoria Street EC 1933. Toilet Roll and Paper Cutting Co., Thurlow Street Works, Bedford 1912-15; Hassett Street Works, Bedford 1914-15; telephone Bedford 282 1915. Toilet papers in rolls and packets, also medicated papers; paper coils and wrappings; slitting done for the trade 1912-15. Government and railway contractors 1914-15. Toilet Tissues Ltd, Barley Mow Passage W4, tel: CHIswick 7923 1958-62. Velvet Crepe Paper Co. Ltd., Bendon Valley, Garratt Lane SW18 1939; Alperton Mills, Mount Pleasant, Alperton, Middlesex 1943-50. Telegraphic address: Papervel Wembley 1943-62. Tel: WEMbley 2258/9 1943-50; WEMbley 8981/5 1958-62; Woodside End, Alperton, Middlesex 1958-62. Manufacturers of interleaved toilet paper, toilet rolls, face tissues, paper handkerchiefs; trade mark Velvex 1943-50. 1958, 1962. Wesley, Harold Ltd. Mills & Head office: Harley Mills, Acton Lane NW 10. Tel: ELGar 6801 (5 lines). 34-40 Ludgate Hill EC4, tel: CITy 1833. Factory at Burton-on-Trent 1950. Manufacturers of the Harley sanitary roll. Willad Paper Mills Ltd., 49, Old Bond Street W1 1944. The announcement in the national press on 19 October 1989 that Bronco was to discontinue the manufacture of hard toilet paper marked an important stage in the thousand year history of this commodity, a history which cloacopapyrologists are only now beginning to document adequately. In the account which follows I shall use the non-U term "toilet paper" in preference to the U term "lavatory paper" since this is the way it was first designated in trade literature during the Victorian period. It is the Arab writer Abu Zaid Hasan al Siraff (fl. 916) who first described the use of toilet paper in a collection of travels translated into French in 1845 as Relation des voyages faits par les Arabes et Persanes dans l'Inde et à la Chine dans le ix siècle de l'ère chrétienne by M.Reinaud. He reports of the Chinese: "They do not take care for cleanliness and they do not wash themselves with water after paying a call of nature, but they only wipe themselves with paper." The obscure and probably revolting habits of medieval times will not be touched on here. Apart from tending to the purely scatological, their contemplation is certainly not germane to the study of printed ephemera. A great nombre of them whych purchased those superstycyous mansyons, reserued of those lybrarye bokes, some to serue theyr iakes, some to scoure theyr candelstyckes, and some to rubbe their bootes. Newspapers for more than a century supplied the readiest source of toilet paper. In the Northampton mercury no. 115 of 9 July 1722 a bitter attack appeared on James Pasham, who was attempting to start a rival newspaper, the Northampton journal. The first issue of the newspaper was described as "his first parcel of bum-fodder" and the luckless Pasham as a "noisy animal" and "old dotard". The newspaper appears not to have survivied this blistering attack. The use of printed papers as toilet paper is recommended by Lord Chesterfield in his Letters to his son, published in 1747. He counsels his son to avoid waste of time and points to the example of one well organised gentleman: "He bought, for example, a common edition of Horace, of which he tore off gradually a couple of pages, carried them with him to that necessary place, read them first, and then sent them down as a sacrifice to Cloacina; thus was so much time fairly gained ..."
It was in America that specially produced sheets of toilet tissue were first manufactured. An early example is Gayety's Medicated paper, produced in packs of 500 at New Jersey in 1857. 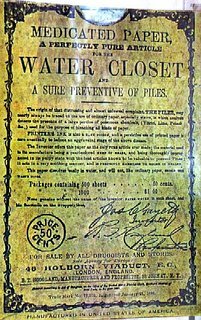 A patent for a continuous roll of toilet paper was taken out in 1870, Scott Brothers of Philadelphia being among the earliest manufactuerers of toilet rolls, and the production spread to England in the 1880s. Among the earliest British firms is the British Patent Perforated Paper Company, established in Banner Street, St. Luke's in 1880 and the manufacturer of Bronco. By 1890 a number of specialist makers are recorded in London, among the most successful being W.W.Colley and Co. of Hatton Garden, sole patentees of the Terebene perforated paper, who won the prize medal at the Paris Exhibition of 1889. All the lavatories at the Paris Exhibition, including those in the newly erected Eifell Tower were equipped with Terebene Toilet paper. Another manufacturer, G.W.Atkins & Co. claimed to have held royal warrants to all crowned heads since 1817. Britain seems to have led the world in these heady days, in fact one firm, the Paper Cutting and Toilet Requisite Co., was not ashamed to have as its telegraphic address in 1895: Toilet, London. This firm was then contractor to the Government and the India Office, perhaps the first producer of the many varieties of "Government Property" paper so popular with collectors who seek out the plethora of different shades of ink, type faces and cryptic symbols. The hard-fought British supremacy was soon to be challenged; Matthias Luttgen was established in Paternoster Row itself by 1908. This firm had its head office in Hamburg and only two years earlier Hachette ainé, established in Paris in 1860, is advertising in the London directory. Japanese papers also made their presence felt by the Edwardian era; the Army and Navy Stores catalogue advertised the Mikado elastic crepe paper at 44 shillings per gross of packets in 1907. Crepe paper, or soft tissue as it is known to the trade, did not challenge the British loyalty to hard tissue for several decades, despite the presence of the Rosenfelders, refugees from Hitler's Germany, who set up a mill producing crêpe paper in Walthamstow in 1932. There is a bewildering variety of trade names from the early years of this century, some of them still household names. Some imply strength and reliability (Bulldog, Samson, Virilla), others gentleness (Satine, Ivorine), others hygiene (Medipathic, San Toi) and others patriotism (Victoria, Queen, Gloria Victis and British no. 1 thin. This last was the name of Bronco prior to 1894. It had first been manufactured by the British Patent Perforated Paper Co (now British Tissues) in 1890. By the first World War most methods of dispensing had been developed. 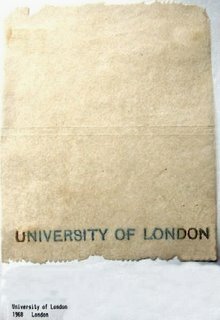 The pack appears to have been the first, the sheets sometimes being held together by staples or string, but they were soon followed by the roll, not always rouletted as today but frequently perforated. 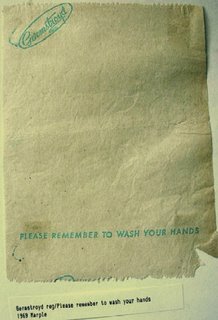 An advertisement of 1906 for the Automatic Toilet Paper Rack states: These papers are put in neat distributors for hanging on the wall; only one sheet of paper can be drawn at a time, and litter and waste are avoided". This principle is reflected in the brand name Onliwon, a system of folding first recorded in 1930 and still in use in public lavatories in the 1980s. 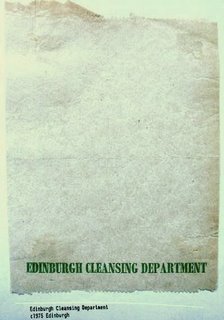 The cloacopapyrologist is most interested in the inscribed varieties, which range from the frequently shoddily produced examples of provincial typography on "Council Property" to the proudly displayed 16 point Thorne bold condensed of "Edinburgh Cleansing Department". Nor is this the largest type face used; Clacton Urban District Council used a striking 48 point sans serif face. 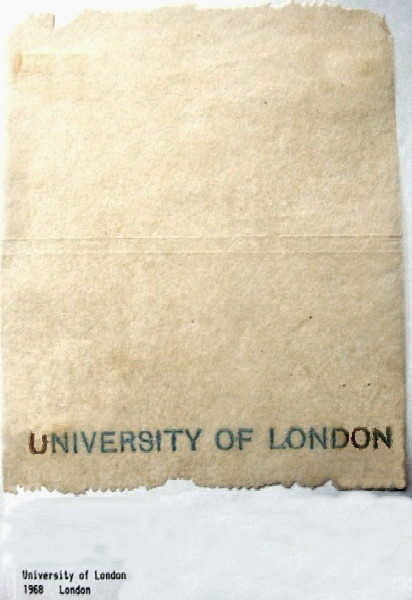 Apart from local and national government the following are examples of institutions which have used inscribed toilet paper: Associated British Cinemas, Barclays Bank, British Aircraft Corporation, Central Electricity Generating Board, London Transport, National Coal Board, Kendals Stores, London School of Economics and the United Kingdon Atomic Energy Authority. Such inscribed varieties were largely confined to the United Kingdom, with its smooth surfaced papers; the frequently quite elaborate textures of continental papers take print less well. Exceptions are the frequently colourful products of the Deutsche Bundesbahn in blue, orange or purple inks. The occurrence of alternating variants throughout many rolls or packs indicates to the analytical cloacopapyrologist the frequent use of reciprocating presses. 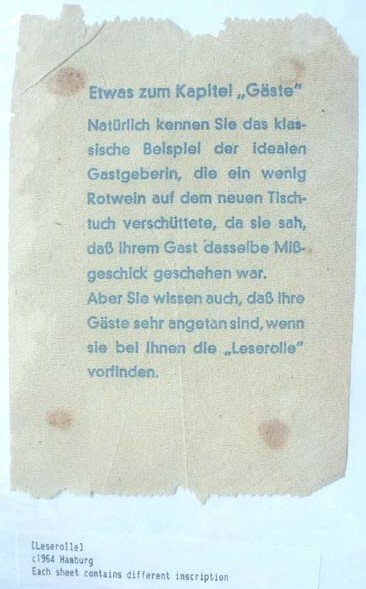 In Germany, where inscriptions are in comic rather than in cine mode, this has not normally led to rotary printing, perhaps because of the problem of the drag of the crepe paper. 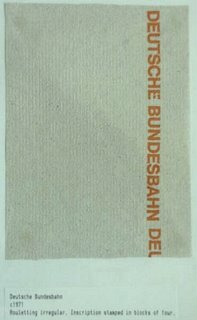 In one instance it was clear that printing was effected by the repeated impression of a row of four settings of "Deutsche Bundesbahn". Rotary printing would be more suitable however for more extensive inscriptions, and toilet paper has readily lent itself as a medium for humour, often of a coprolitic nature. In Japan a set of caricatures of dollar bills has been produced for the American market inscribed "United Seats of America" and signed "Lou Stool". Both England and Germany have rolls with cartoons bearing such captions as "Psychiatrist has a silent P". The German Leserolle has a different anecdote on each sheet in the roll and in 1980 Onsworld Ltd of Stamford, Lincs produced a roll with crossword puzzles. Both World Wars saw toilet paper pressed into service for propaganda. In the first World War the manufacturers of Beechams Pills sent sheets of toilet paper to the front reassuringly "printed with clarified ink on non-irritant paper", containing cartoons and jokes including the advertisement "Take Beecham's Pills for active service". The Germans too issued sheets with a series of "Lying reports by our enemies" beautifully printed in Fraktur type. One, allegedly extracted from the Daily telegraph reads "An absolutely authentic source reports: The Germans are completely enclosed in Belgium." The gradual demise of hard paper makes the printed sheet of much rarer occurrence. Admittedly patterned and coloured rolls can now be purchased to match the decor of the bathroom. However these products, attractive as they are, cannot compensate the cloacopapyrologist for the loss of the inscribed sheets, many of which must have disappeared without record. After all, most ephemera is printed with the intention of being read at least once before disposal, something which is not normally the case with toilet paper which must therefore be accounted the most ephemeral of ephemera. Scroggie, Jean. "Now wash your hands" Sunday telegraph magazine (1 February 1987). Reyburn, Wallace. Flushed with pride : the story of Thomas Crapper. New edition. (London: Pavilion Books, 1989), p.79-82. Monumenta chartae papyraceae cloacales historiam illustrantia (Toilet Paper Publications Society) In preparation. For the last quarter of a century I have devoted much of my life to an attempt to ensure that cloacopapyrology is accepted as a serious academic discipline. From the time that I mounted the first samples of inscribed toilet paper in my albums in the late 1960s, I realised the cultural significance of the material I was collecting, but it has been an uphill struggle to persuade others of its value. My first attempt was in the pages of She magazine in March 1970 following an uninformed article that had been published. The resulting correspondence included a letter signed "twelve office girls" who expressed themselves as "extremely sorry for you indulging in your pathetic hobby". In December 1976 my message fell on more receptive ears when I delivered the Christmas lecture at the Ephemera Society. In fact I owe the Society and especially its Vice-President Maurice Rickards an immense debt for their encouragement over the years. In 1980, deemed by the Society to be the Year of Ephemera, samples from my collection were exhibited in Bexley Libraries. The 1980s was a decade of consolidation during which most of the techniques of cloacopapyrology were refined. These were based partly on the practices of analytical bibliography, with other elements taken from fields such as philately. It now became possible to describe the various methods used to separate sheets of paper (such as perforations of varying gauges or dog-tooth rouletting) in a manner that could be internationally accepted, and progress was also made in drawing up standards for transcribing inscriptions. Some attempt was also made to research the history of toilet paper and a computer database of manufacturers was compiled. This has made possible the dating of surviving early specimens in several collections. In December 1990 the results of this decade of research were summarised by me in an article in The ephemerist and this led to a belated growth of interest in cloacopapyrology. Copies of the article were requested from as far away as the Semmelweis University of Medicine in Budapest, my collection was featured in an article in The independent on 8 September 1990 and this led to an interview on the John Taynton show on BBC radio later that month. It also led to a brief appearance on prime-time television in June 1992. The fact that it was on "Noel's addicts", fronted by the entertainer Noel Edmonds, rather than "Arena" or the Open University shows that cloacopapyrology still has a long way to go before it is taken seriously. Radio is not so much a prey to the trivialisation resulting from an obsession with viewing ratings and toilet paper had a whole programme to itself in the Radio 4 series "Keep it clean" in September 1992. This shows that things may be looking up for cloacopapyrologists - which is as it should be in an age of post-structuralist relativism where the subject should be seen as an area of research with a validity as great as the critical study of the classic writers of literature. After all, it shares many features with the world of books - censorship (the controversy of the Romany toilet roll in 1990), propaganda (its use in both World Wars), as well as questions of style and typography for example. So far, though, academic institutions have been too elitist to show any interest in setting up a research institute, nor has any sponsorship been forthcoming from industry to promote research in this field. And there is much that remains to be done. Our knowledge of the early techniques of production is equivalent to that in historical bibliography before the work of pioneers such as R.B.McKerrow. There is a need for a wide-ranging patent search and for the investigation of manufacturers' archives. International surveys must be urgently undertaken to locate examples of cloacopapyrological incunabula - 1914 being a suitable cut-off date for toilet paper. No time must be wasted as the paper used frequently has a low pH value and a programme of deacidification should be undertaken. Efforts must be made to achieve the publication of the monograph series Monumenta chartae papyraceae cloacales historiam illustrantia for which material continues to accumulate and there is a need for a digitsation programme to capture and provide access to the inscrptions on this impermanent medium. I hope that I have the credentials to be taken seriously. Besides the years I have devoted to my collection, which now has several hundred samples covering a range of countries and a number of decades, I have a range of more orthodox bibliographical publications to my credit, covering the history of the London, provincial and more specifically the Devon book trades, and have spent many years as a librarian in local studies collections. These experiences have convinced me of the importance of the minutiae of printed ephemera in building up a full picture of society in the past. If this, the most ephemeral of ephemera, cannot form a part of this picture, it is a sad reflection on the narrow vision of the academic world. Note: This paper is a revised version of the one prepared for the Ephemera Society in 1992.